So you’ve arrived in Queenstown, the adventure capital of the world with only 4 days to get to Christchurch – so what are you going to fit into that time? 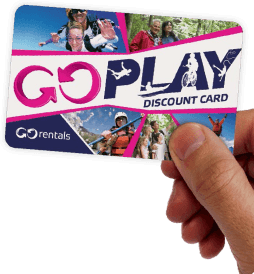 Let’s start by picking up your lovely GO Rentals hire car and heading straight for Queenstown and let the fun commence. Let’s GO! 2) Skippers Canyon Jet – reaching speeds of up to 85mph this ride up the tight Skippers Canyon is sure to get your pulse racing. The 360 degree spins will get you closer to the wall than you feel comfortable with! Described by Rudyard Kipling as the eighth wonder of the world, Milford Sound is THE MUST DO for anyone visiting the South Island. A great chance to give the new GO Rentals hire car a run out, the 4+ hour drive from Queenstown is well worth the early start to check out the magnificence of this most spectacular fjord carved out by glaciers during the ice age (that’s a long time ago by the way!). For those wanting a more hands on experience of Milford Sound, why not give kayaking a go. There’s nothing quite like taking to the open water and paddling yourself out into one of the most inspiring places on planet earth. GO Play partner Real Journeys offer a 4-5 hour trip on the water with spectacular views up to the Pembroke Glaciers. After a very busy couple of days in and around Queenstown, it’s time to hit the road and head north to your final destination of Christchurch. There is plenty so see and do along the way making this journey a day out in itself and ensuring you arrive in Christchurch feeling like you’ve had a real South Island adventure. • Swimming with dolphins -The Dolphin Encounter offers a brilliant opportunity to get in the water in the south Pacific and swim with these amazing animals. Even better news is that Encounter are a GO Play partner so will sort you out with a 10% discount. Winner! From Kaikoura, it’s a relatively short drive back to Christchurch where you can head off to catch a plane or head home!